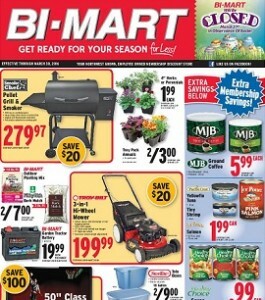 Bi-Mart Weekly Ad Sale, valid April 18 – April 24, 2019. Deals and offers you can shop in a Bi-Mart store: Wrangler Men’s Regular Fit Jeans; Magnavox 50” Class LED TV; Purex Liquid Laundry Detergent; MJB Ground Coffee; Pacific Crest Yellowfin Tuna; Troy-Bilt 3-in-1 Hi-Wheel Mower; Atta Cat! Dry Cat Food; Honda Engine Pressure Washer; Mobil 1 Synthetic Motor Oil; Funai Dual Deck Recorder; Altec Bluetooth Life Jacket Speaker H2O; Fuji Film Digital Camera Bundle; Armitron & Casio Watches; Night Owl Security Cameras with 4 Channel DVR; Rustler Classic 5 Pocket Relaxed Fit Jeans; Key Denim Carpenter Pants; Coleman Men’s Mid Height Hikers; Mr. Coffee 12 Cup Coffee Maker; Oster Newcrest Skillets; Shark Navigator Lift Away Vacuum; Garnier Nutrisse Hair Color; Colgate Toothpaste; Chef Boyardee Pasta Dinners; Blue Diamond Almond Breeze; and more. Find all deals, offers and prices in the latest Bi-Mart Weekly Sale Ad Circular.